Mention “tap handle” to someone and it’s likely their head fills with visions of craft beer. The explosion in breweries brings with it an insane variety of artful handles, all vying for attention. 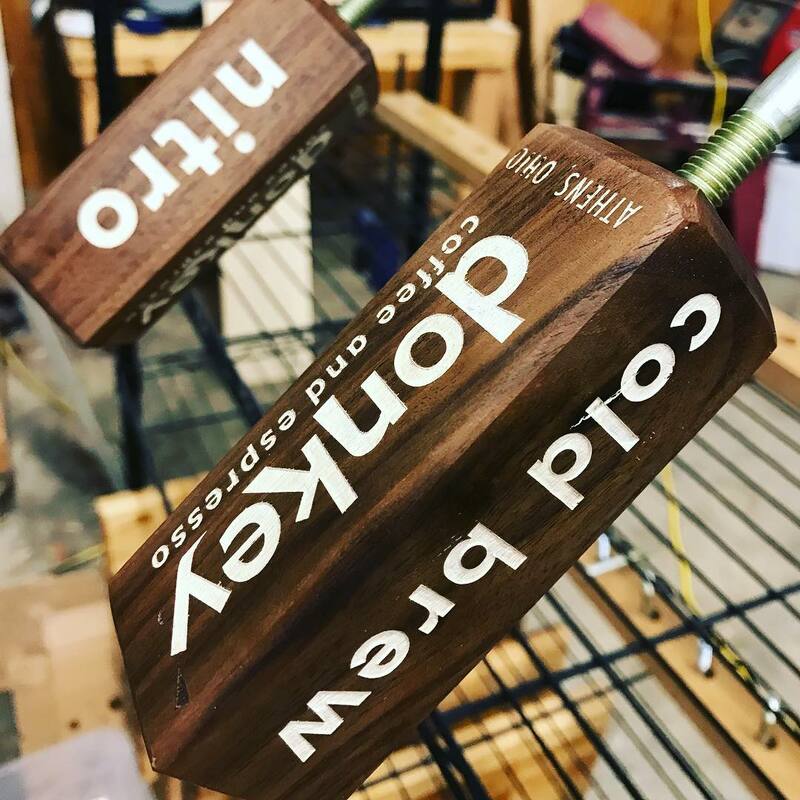 We’ve made beer tap handles of course, but this post highlights our non-beer projects. 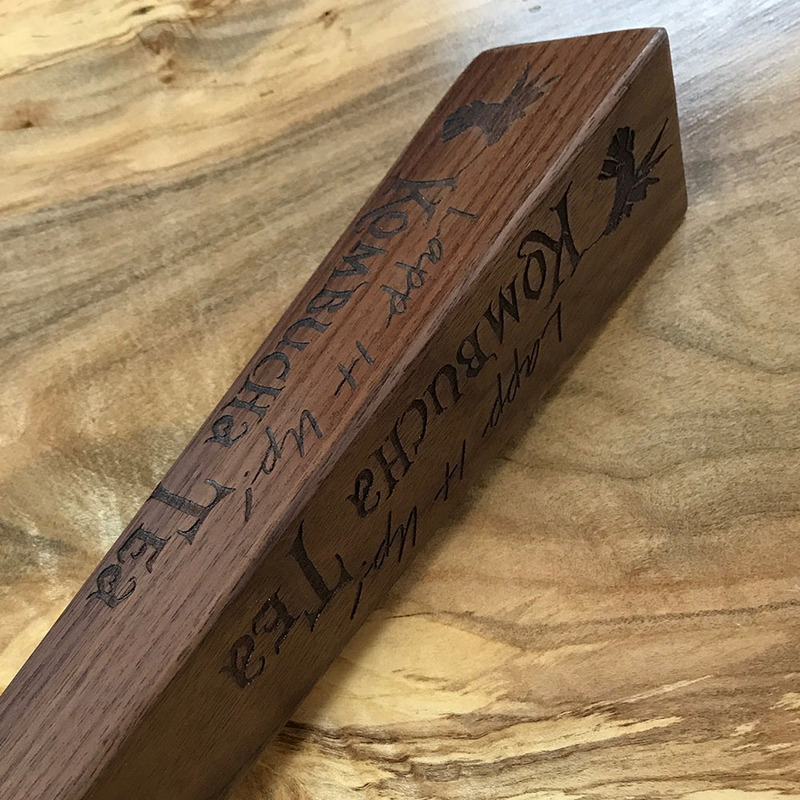 Since we take on small orders, we’ve been able to do runs of specialized tap handles for small taprooms. We’ve also got work on taps around Ohio. A tap handle needs to carry a company’s brand. The colors, shape, and imagery must convey the values of the business. And to the person doing the pouring of liquids (and storing of unused tap handles), utility and simplicity is appreciated. This Athens institution needed some branded tap handles to go with their nitro cold brew. The “roasty” brown finish complements a coffee shop’s vibe, with bright lettering to catch the eye of any groggy college students. The modest size keeps them from getting in the way behind a busy counter. We’re proud to have these handles uptown keeping our town caffeinated. 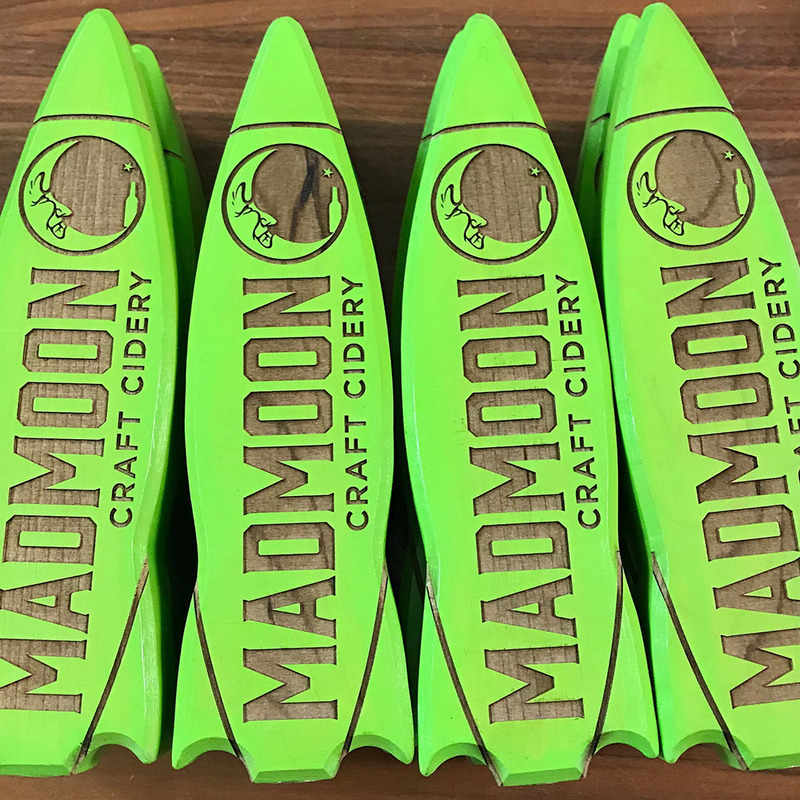 With established and distinctive branding, Mad Moon provided an exciting project. We started off with a bulkier, not-so-practical prototype. It got refined down to this distinctive, iconic rocket ship that fits their branding and stands out among a line of taps, yet isn’t overly complicated or delicate. 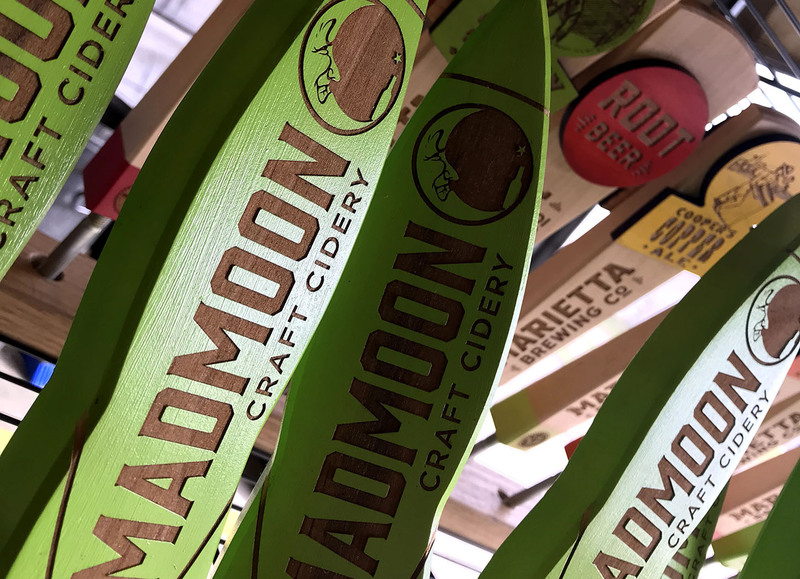 This is perhaps our most widely traveled tap handle, and you can see it at Mad Moon accounts all over Ohio. Our first non-beer tap handles! And some of our earlier tap handles in general. Stop by the shop sometime and ask Tim about making the shapes for these.  You can find Lapp it Up bottled in retail spots all over Eastern and Central Ohio. 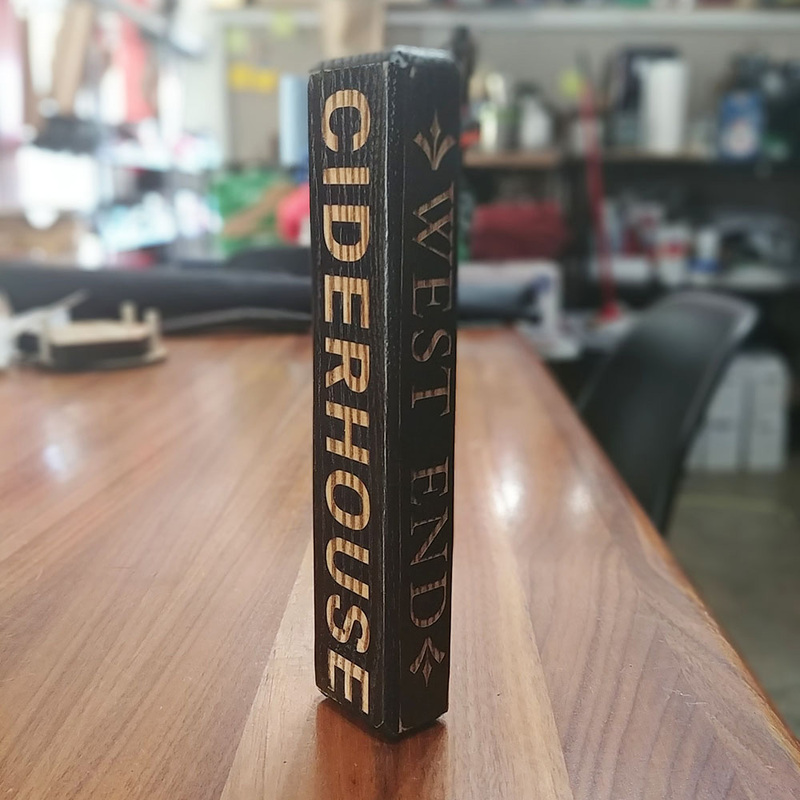 That describes what’s on tap at the West End Cider House in Athens. It also relates to our design concepts for this project. Their bar space suits these refined, matching slender tap handles. We’re so pleased that our work is associated with such high quality beverages as the ones listed above. If you need tap handles for beer (or otherwise), whether it’s small runs for in-house use or to send to accounts, please don’t hesitate to reach out. We love to experiment with fun designs while making sure your brand is accurately represented in the noisy marketplace. Thanks for exploring our work!